For more than 30 years, Mr. Efflandt has assisted businesses of all sizes, lenders, trusts, and individuals navigate the complexities of environmental law. His practice includes representing clients in environmental litigation and administrative enforcement actions arising under both federal and state law. Mr. Efflandt works with the firm’s M&A lawyers to focus and implement environmental diligence activities and draft transaction documents. He has substantial experience counseling clients in matters arising under most federal environmental statutes, as well as a wide-range of state statutes and regulations. Overall, Mr. Efflandt’s priority is to solve client problems as quickly and inexpensively as possible using his expertise and years of experience working with regulators. Mr. Efflandt was one of only twenty-two environmental attorneys nationwide named a Charter Fellow and elected as a Founding Regent of the American College of Environmental Lawyers. Mr. Efflandt enjoys Martindale-Hubbell Law Directory’s highest “AV” rating for lawyers and has been selected by his peers for inclusion in The Best Lawyers in America©, the Missouri & Kansas Super Lawyers® list, and Chambers USA as a leading environmental lawyer in the United States. In 2011, 2013 and 2018, he was named by Best Lawyers® the Wichita Environmental “Lawyer of the Year.” His peer memberships include the Kansas Association of Defense Counsel and the Defense Research Institute. Mr. Efflandt's knowledge and experience in the area of environmental law is extensive. He has represented clients throughout Kansas, as well as other states, in environmental litigation, regulatory and transactional matters. He has represented potentially responsible parties (PRPs) and PRP groups at numerous Superfund/CERCLA sites in Kansas and elsewhere. Mr. Efflandt was a key participant in the development of an innovative Superfund site program involving a partnership of PRPs, lenders and municipal government that received national attention and acclaim. He has successfully represented clients in a wide-range of environmental matters including RCRA/hazardous waste compliance, permitting and enforcement; Clean Water Act permitting, enforcement and wetlands matters; greenhouse gas regulatory compliance matters; agribusiness permitting, compliance and related litigation; administrative appeal matters; community right-to-know counseling and enforcement; and environmental matters related to oil and gas production, refinery facilities and storage tank operation and releases. Mr. Efflandt has represented clients in litigation involving federal environmental statutes and regulations, including Superfund cost recovery and contribution actions and RCRA citizen's suit actions, as well as state environmental property damage and personal injury actions. 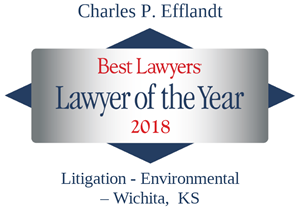 In the course of his extensive regulatory practice, Mr. Efflandt has developed working relationships with many legal and technical representatives of the United States Environmental Protection Agency, Region VII, the Kansas Department of Health and Environment and other state and municipal environmental agencies.